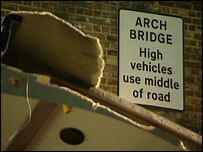 Six people were injured when a double decker bus crashed into a railway bridge in north London. The bus had been diverted along Prince of Wales Road because of a major fire at Camden market on Saturday. A police spokesperson said one man suffered serious head injuries when the roof was pulled off the vehicle. The route 24 bus between Hampstead Heath and Pimlico normally goes through Chalk Farm Road. Drivers have been asked to avoid the crash site. The crash happened near the junction with Talacre Road at about 0900 GMT. A Transport for London (TfL) spokesperson said buses had been using the route under the arched bridge safely for 24 hours before the crash happened. He said: "The route is a recognised diversion route and drivers know to drive straight through the middle." Rail workers were the first on the scene and managed to help many passengers off the bus. Richard, a passenger on the bus behind, watched the crash from the upper deck. He said: "There were road markings on the bridge and on the road telling drivers to keep to the middle, but I saw the bus go into the wall. "All the windows popped out and the roof just peeled back about half way. "The people at the back had time to duck and were protected by the chairs." Councillor Matt Sanders, the Haverstock representative for Camden Borough, was travelling on another bus behind the crash. He said: "The first I knew about it was when we ground to a halt and then saw the emergency services arrive." Buses and overground rail services have been disrupted, and tickets are being accepted on London Underground. 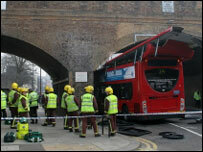 An investigation into the crash has been launched by TfL and the bus operator, London General. Saturday night's fire caused serious damage to the area's famous market. Storage buildings for the market and the nearby Hawley Arms pub were also damaged and local residents had to leave their homes. Police warned that main roads could remain closed for up to four days. The emergency centre set up at Talacre Sports Centre to help people evacuated during the fire was reopened for bus passengers, but was not needed. Several people were treated for shock by paramedics.